In closing his tremendous section in the Reformed Dogmatics Volume 2: God and Creation on the dogma of the Trinity–God’s being one being, yet three persons–Bavinck gives a number of arguments for importance of the Trinity. That God is Father, Son, and Spirit gives us the truth of the fact that God is a living God without pulling us into the various errors of pantheism, monism, and deism (p. 331). He is the one who is Three whose internal life is truly lively with the generation of the Son of the Father and the procession of the Spirit from them both. What’s more, out of this fullness of eternal life consisting in mutual glorification, blessedness, is the ground for a doctrine of creation that, again, doesn’t fall into those various errors. Instead, because God is triune, out of the movement and perfection of his own inner life he can make a world that is not himself, upon which he is not dependent or in needy, yet can truly be an object of his love and self-communication (p. 332-333). The entire Christian belief system, all of special revelation, stands or falls with the confession of God’s Trinity. It is the core of the Christian faith, the root of all its dogmas, the basic content of the new covenant. It was this religious Christian interest, accordingly, that sparked the development of the church’s doctrine of the Trinity. This is so strongly felt that all who value being called a Christian recognize and believe in a kind of Trinity. The profoundest question implicit in every Christian creed and system of theology is how God can be both one and yet three. Christian truth in all its parts comes into its own to a lesser or greater extent depending on how that question is answered. In the doctrine of the Trinity we feel the heartbeat of God’s entire revelation for the redemption of humanity. Though foreshadowed in the Old Testament, it only comes to light fully in Christ. Religion can be satisfied with nothing less than God himself. Now in Christ God himself comes out to us, and in the Holy Spirit he communicates himself to us. 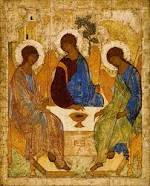 The work of re-creation is trinitarian through and through. From God, through God, and in God are all things. Re-creation is one divine work from beginning to end, yet it can be described in terms of three agents: it is fully accomplished by the love of the Father, the grace of the Son, and the communion of the Holy Spirit. A Christian’s faith life, accordingly, points back to three generative principles. “We know all these things,” says article 9 of the Belgic Confession, “from the testimonies of holy Scripture, as well as from the operations of the persons, especially from those we feel within ourselves.” We know ourselves to be children of the Father, redeemed by the Son, and in communion with both through the Holy Spirit. Every blessing, both spiritual and material, comes to us from the triune God. In that name we are baptized; that name sums up our confession; that name is the source of all the blessings that come down to us; to that name we will forever bring thanksgiving and honor; in that name we find rest for our souls and peace for our conscience. Christians have a God above them, before them, and within them. Our salvation, both in this life and in the life to come, is bound up with the doctrine of the Trinity; yet we grant that we cannot determine the measure of knowledge—also of this mystery—needed for a true and sincere faith. I’m writing this post today because, in the broader church calendar, this is “Trinity Sunday”, a Sunday traditionally set apart for preaching on, teaching about, and honoring God as Trinity. And there is wisdom setting aside a Sunday to explicitly do so. The one caution I would throw up is to say is this: take care that we don’t think the doctrine of the Trinity is one we can save for one Sunday a year, to reflect on. It’s not to be sidelined, or put in the corner again until next year, as we preach on the “main things” of the gospel or the Christian life. Why? Because in all of Christianity, in the gospel, we have to do with God–restoring right relationship with him, living before him, being transformed into his Image. But what we must remember is that there is no other God than He who is Father, Son, and Holy Spirit. In other words, today might be Trinity Sunday, but every Sunday we have to do with the things of the gospel, we have to do with the things of the Trinity. I know you won’t resonate at all with my iconoclastic approach on this, but,,,, I would be much more inclined to think that the “entire Christian belief system, all of special revelation, stands or falls with the confession of God’s Trinity” if it were something that the Apostles had come close to expressing as being as important as you an Bavinck do. Most every Christian tradition exalts these post biblical doctrines over the simplicity of the Gospel, so you are in familiar and thereby comfortable territory. But to think that “salvation, the history of redemption itself, hangs in the balance” of our exaltation of the “creed and system of theology” of the Trinity just seems anachronistic to me both looking backwards to the scriptures themselves and forward to the church in the future. I do worship the Father and His Son in the Spirit, but don’t need 1700 years of accumulated theological baggage to do so faithfully.